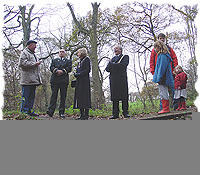 On Saturday 27th November the Lord Mayor of Leeds Mr Christopher Townsley and the Lady Mayoress Mrs Margaret Townsley officially opened the footpath through the woods between Gledhow Lane and Allerton Grange Way. 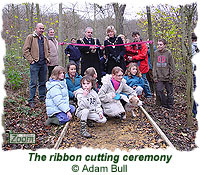 The footpath was finally completed after 5 years of hard work by the Friends of Gledhow Valley Woods. 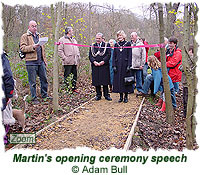 After welcoming the Lord Mayor and Lady Mayoress everyone walked half way along the new path, at which point the Friends' Chairman Martin Calvert gave a short speech before the official ribbon cutting ceremony (a full transcript is provided further down this page). 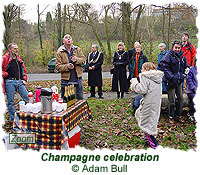 The walk along the path then continued, and was followed by a champagne and cake celebration. The event was also mentioned in a short Yorkshire Evening Post article, which can be seen in the Press Clippings & Media Publicity section. 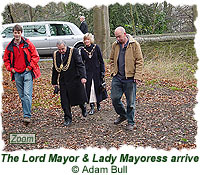 "I'm especially pleased that the Lord Mayor and Lady Mayoress are able to attend on this auspicious occasion. 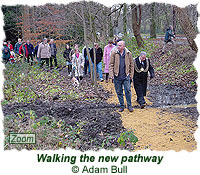 The Friends started work on this path over five years ago in the early days of the group. 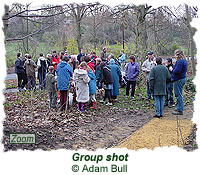 We've gradually added sections on over the years but it was only when we successfully applied to Green Leeds for a grant that we have been able to finish it off. Green Leeds are the people who administer the landfill tax and we qualified for a grant. We got the go-ahead last October and aimed to finish the path off in twelve months. This we have done thanks to the determined efforts of the Friends of Gledhow Valley Woods along with help from various other bodies. FGVW was formed in 1996 mainly through the efforts of Richard Lancaster, the LCC Conservation Officer at the time. Richard directed us, taught us skills and steered the FGVW ship in those early years. He proposed the first bit of pathwork a few yards that way so we have a lot to thank Richard for; namely 1 mile of wooden edging, hundreds of wooden stakes and about 100 tonnes of sandstone. Thank you Richard. Did he envisage the path ending up like this? I didn't. He probably did. Richard moved on to pastures new and since then we have received enormous support from LCC Ranger Graeme Ashton and Elaine Hill. They have both been brilliant. A big thank you also to Green Leeds for giving us the funds to spend close on £5,000 to finish off the path this last year. Sue Lumby of Green Leeds has been very helpful. Thank you Sue. Part of the funds has been spent on contracting the BTCV to come in and do the difficult bits. They have done an excellent job and have always done more than they were contracted to do. We have learnt many new skills from watching them. Thank you to Richard and his team. 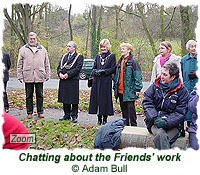 Various local councillors have also supported us in our work, two in particular. Brenda Lancaster has been our rock, providing enthusiastic support, always willing to help, turning out on Action Mornings. She's a star. Thank you. Also Richard Harker has been extremely supportive, again volunteering his service son many occasions. Thank you Richard. Finally, thank you to the Core group that meets monthly to plan the group's activities, and all the volunteers who have made this path a reality. So here we have a path that runs through half a mile of the Gledhow Valley. It used to be accessible only to those with a brave heart and a good pair of wellies. Now it's a lovely stroll through the new plantation, then alongside the stream through ancient woodland, and will open up the woods for many more people to enjoy. I should now like to ask the Lord Mayor to declare our path officially open, take a stroll there and back and share a glass of champagne with everybody in celebration. Thank you."